Editor: We are very pleased that Alain Briot shares his experience about moving his studio from one location to a different one. Alain's articles are always a good reading and then he pays attention to so many details. Alain writes this diary while the real move is the focus of his life. Again the most current entry will be on top. I have been extremely busy since my last entry. 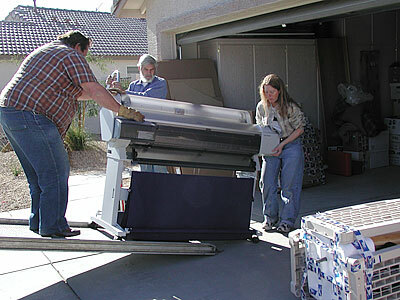 First, I had to "empty the garage" so to speak and move everything that had been unloaded there into the house. 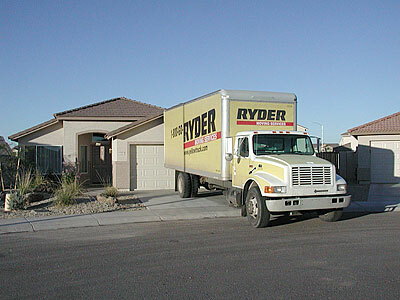 As you all know garages quickly become temporary (or sometimes permanent) storage areas. 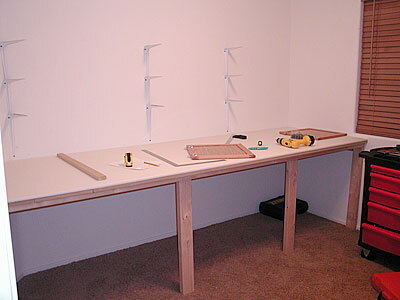 Then I also had to build a new workbench to do all my matting, framing and other jobs. My previous one was approximately 4 foot long. 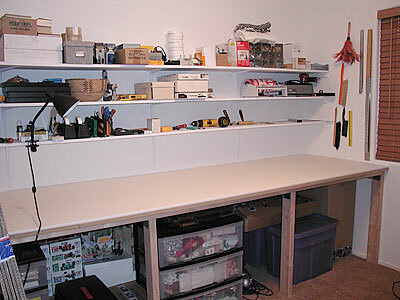 This time I took advantage of the extra space and built a 10 foot long workbench. 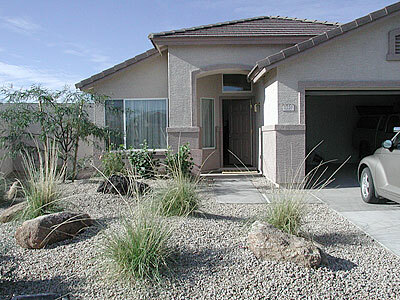 The photo below shows you the early stages of the building process. thus protects the edge of cutting tools when they are used on it. This is important to me since I cut all my prints on this table. I don't own, and don't favor, rotary or blade cutters preferring to cut the borders of my prints using a ruler and a utility knife. I change the blade on the utility knife as often as necessary to keep the edge sharp. The cutting surface allows me to make straight, clean cuts and not damage the blade unnecessarily. I also do all my matting on this table (mat assembly that is) and all my framing. For framing the table is covered with a large, soft cloth so that the frames do not get scratched. I am considering using white cloth "curtains" to hide the underneath part of the table. I did this before and it works a lot better than doors which take too much room to open. With a cloth curtain you can simply lift up the cloth to access what is underneath the table. At this point my move is completed and so is this diary. I may or may not add other entries. This was a fun process and the result is a success. Thank you to all for your interest. Driving from Chinle to Peoria was a smooth process, especially since I did not do the driving (my friend did). 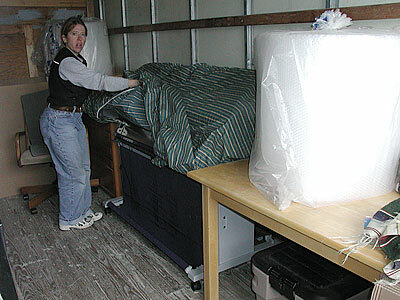 We arrived in Peoria in the evening and I preferred to wait until the next morning to unload the truck. Unloading also went smoothly, essentially since we had a lot of help. In documenting the unloading process I again focused on the 9600. Here is the 9600 coming off the truck. No problem there. 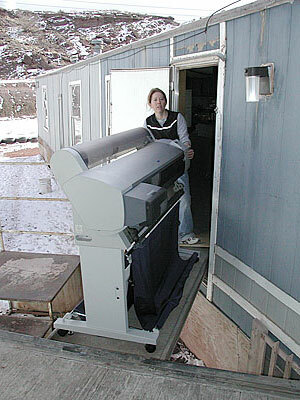 Just make sure you have someone in front to control the direction and someone in the back to hold back the printer so it doesn't go flying down the ramp. Here is the 9600 being pushed through the garage. And, finally, here is the 9600 in its new home. 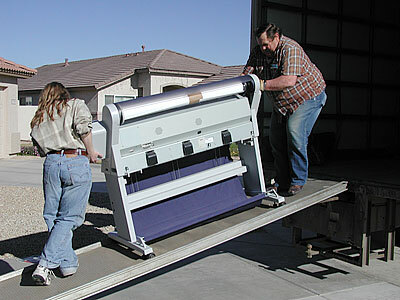 Unloading the matte cutter went equally smoothly. I did not document it through photographs unfortunately because I was involved in unloading it myself. 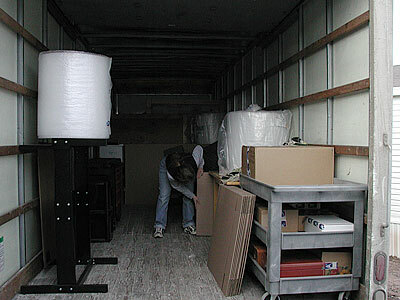 Also, because it was loaded first, it was the last thing to come off the truck and by then I was exhausted. Basically we took it apart, carried each piece into the house, and reassembled it. The most delicate part is the cutting table which was carried by four persons. comfortable driving "big rigs" and since crashing was not an option. I took a number of photographs while loading and unloading and these will be presented in this diary today and the following days. My idea is to sort of reconstruct the move in a chronological manner. Today we will look at how the truck was loaded. Throughout this process you will notice that I paid particular attention to show how the 9600 was moved. I did so because a number of readers have a 9600 or a 7600 and because this printer is the subject of a separate diary (the two diaries are linked in fact since moving the 9600 is part of my 9600 diary). 9600 stand proved not only up to the task but above it. 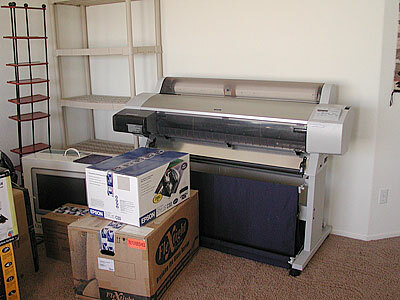 The fact that the stand has wheels makes moving this relatively heavy printer very easy. the cartridges in ziplock bags to keep them from drying out, and that was it. Once in Peoria I simply reinstalled the ink cartridges. No ink leaked into the printer during the move and no other problem occurred as far as I can tell at this point. 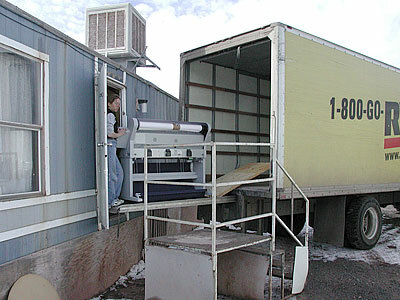 Here is the 9600 ready to be loaded on the truck, on its way out of the door. I built a ramp out of plywood sheets and placed it against the truck's loading ramp. Here's the 9600 on the ramp. Here is the 9600 on the ramp. 9600 on ramp between truck and house. Notice the plywood sheets. The 9600 is in the truck. 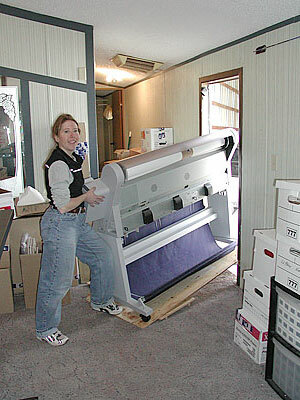 Notice that Natalie is able to maneuver the 9600 by herself showing how easy it is to move this printer. 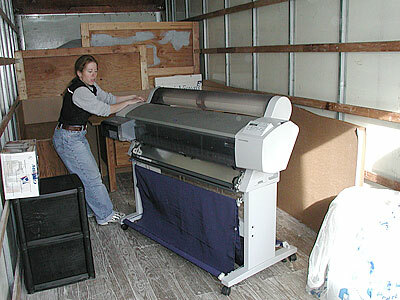 We placed a cover, in this case a bed sheet, on the printer to protect it from dust and other debris. 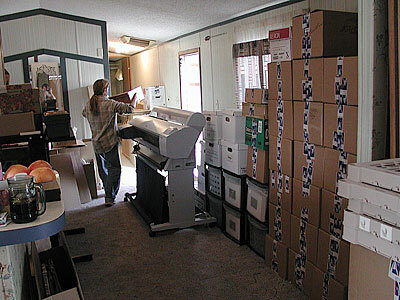 Finally we used sheets of cardboard, in this case flat frame shipping boxes, to further protect the edges of the printer from contact with other objects and from shocks.